← You Like Pork Chops, You’ll Love Lamb Chops! Why should we eat our broccoli? Is it really that good for you? Of course, the answer is yes but do we really know what we are getting when we eat our broccoli. Let’s explore the findings of a recent study. The George Mateljan Foundation had a group of smokers participate in a study to see the effects of broccoli consumption over a short period of time, just 10 days to be exact. Participants were asked to eat 1.66 cups of steamed broccoli a day for 10 days. At the beginning of the study, they measured participants C-reactive protein (CRP) level, a protein that measures ones general state of inflammation, at the beginning of the 10-day study and then again at the end of the 10 days. Each participant experienced a significant drop in their CRP levels. As if that were not good enough, they found an unexpected benefit, and participants also experienced an increase in their carotenoids and folate levels in their blood results. So, the answer is we should absolutely eat our broccoli. 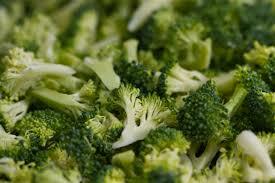 Broccoli is the 16th best source of carotenoids and the 5th best source of folate. According to Linus Pauling Institute, glucosinolates (cancer-fighting weapons) are able to neutralize cancer-causing substances before they can cause damage. Broccoli is one of the leading sources for glucosinolates and has been found to help prevent breast cancer, colon cancer, lung, and prostate cancer. As if the benefits of broccoli’s glucosinolates were not enough to encourage us to eat our broccoli, did you know that broccoli also contains Omega-3’s? Omega-3’s are a crucial part of an anti-inflammatory diet. In 100 calories worth of broccoli, there are approximately 400 milligrams of omega-3s, which is about equivalent to one soft gel capsule of flax oil. The list goes on and on. There really are almost unlimited reasons to eat broccoli. Detoxification, High levels of antioxidants, Anti-inflammatory benefits, digestive improvement, Cardiovascular support, eye health, lower the risk of diabetes and increased metabolism of Vitamin D. The majority of the population of the United States is deficient in Vitamin D, which increase levels of depression, cancer, heart disease and cardiovascular disease. How much should we eat? The Live Strong Association recommends eating a ¾ cup of broccoli a day. That is just 5 cups of broccoli per week. It is recommended that Broccoli be eaten raw or prepared by the quick-steam method. The goal is to keep the color of the broccoli bright green and a little bit crisp. To quick steam your broccoli just steam over a small amount of water for four to five minutes, no more than five minutes, to retain the full nutritional benefits of the broccoli. There are incredible things you can make with broccoli. Kids love broccoli contrary to what most people believe. One of our favorite quick weeknight meals is the cheesy ranch broccoli chicken burritos. In a large bowl, combine rice, broccoli, chicken, ranch seasoning, water chestnuts, and ¾ cup cheese. Stir to combine. Sprinkle the middle of each tortilla will the remaining cheese. Scoop ¼ of the chicken filling onto each tortilla and wrap tucking in the ends. Grill each burrito for about 8 minutes. 4 minutes for each side. Remember to go to the Fill Your Plate to source for more broccoli recipes. This entry was posted in Cooking, Diet Tips, Fill Your Plate, Food, Food Facts, Green Matters, Health Tips, Healthy Eating, Produce, Recipes, Vegetables and tagged broccoli, diet, Dinner, food, Healthy, recipes, vegetables. Bookmark the permalink.